Politicians who oppose abortion often tend to argue they are advocating on behalf of a silent majority of people who believe abortion to be immoral. I've never been convinced by that idea, mostly because people who don't believe in abortion tend to be anything but silent in my experience, but it turns out that people who approve of abortion restrictions are also a minority. According to a new poll, most voters oppose the trend of restricting abortion access, which hopefully means that some of these anti-choice lawmakers will be on their way out soon. But it's not all good news: Unfortunately the poll, which was issued by the National Institute for Reproductive Health (NIRH), also found that there's a big information gap. Although there has been a major push to restrict abortion access on the state level in the past few years, 55 percent of respondents said they didn't know about the recent legislation. But once the respondents were given information from the Guttmacher Institute about the number of bills that have been proposed and passed in state legislature, they didn't support it. After hearing about the number and type of bills passed in state legislatures, 63 percent said that they felt such laws were moving in the "wrong direction"; only 35 percent felt they were a move in the "right direction." When asked to sum up the wave of new laws in one word, some of the most common responses were words like "unfair" and "wrong." Importantly, and in contrast to the types of laws that have been passed recently, 94 percent of Americans in the survey said they wanted information provided to women about abortion to be medically accurate; 82 percent want the experience to be respectful of her decision; only 19 percent think it should be difficult in terms of logistics or travel. Which isn't in line with recent legislation. So maybe it's unsurprising that after hearing about the issues, 51 percent say they are less likely to vote for someone who supported such laws, versus only 29 percent who say they are more likely. Additionally, 54 percent say they will be paying attention to a candidate's views on these issues. According to NIRH President Andrea Miller, American views on abortion tend to be complex, not fitting neatly into either "pro-life" or "pro-choice"; as such, the number of laws aimed at severely restricting abortion access are not in line with the views of most people. 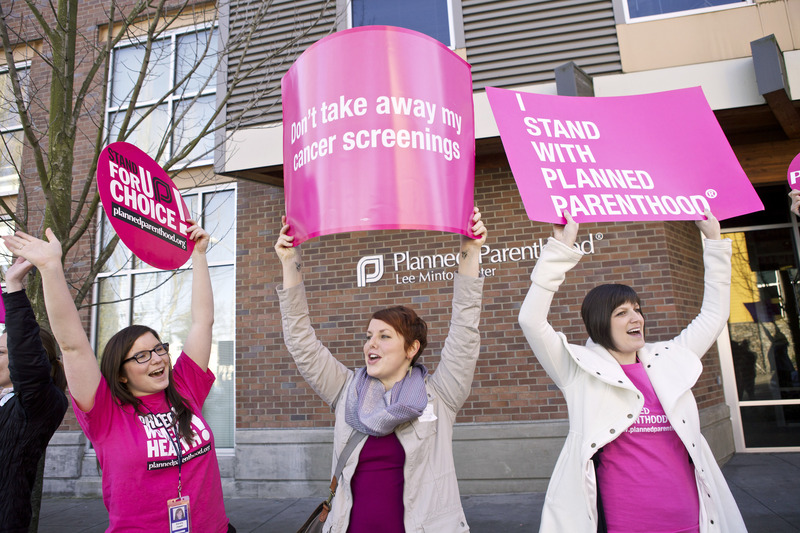 This means that restrictive abortion laws similar to proposals to defund Planned Parenthood may not actually be serving the majority — there are some very vocal people who like the idea, but most Americans consider it extreme. So let's hope more people start paying attention to the issue. Because once they do, it seems clear that lawmakers supporting these bills may find themselves looking for work. You can see more of the study's findings here.